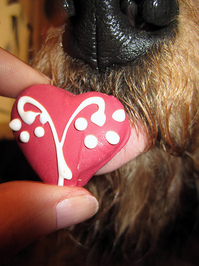 Are you familiar with these common items that can make your pet sick this Valentine's Day? Posted on Tue, Feb 14, 2012 : 5:50 a.m.
Valentine's Day is a fun festive time for us humans, but is can pose trouble for our furry and feathered friends, who have a tendency to be curious about new things that are around the house, like chocolate and other types of candy — as well as flowers and other holiday items. If the petals are ingested, they'll likely just cause some tummy upset, which isn't so much of a problem — but the thorns are, of course. Those can cause injury to paws and the mouth. Surprisingly, this variety of flower is very toxic to cats and can be deadly. From the leaves, pollen, petals and vase water, an unidentified toxin causes kidney failure in felines. It's recommended that, in homes with cats, you avoid bringing these flowers into the house. Candy is particularly inviting to pets — some even have penchant for the sweet stuff! Take special care when there is candy around to keep it locked up and away from pets, perhaps in an upper cupboard with a door on it. Dogs and cats are very crafty and can reach countertops, tables and stovetops. Chocolate is toxic to animals, as it contains a component called theobromine. Xylitol, a sweetener that you'll find in candy and gum, is toxic to dogs, as Dr. Laura O'Rourke of Ann Arbor Animal Hospital explained a few months ago. Use special care with packs of gum in your purse or in your car's console. Call your veterinarian or the ASPCA Animal Poison Control Center at 888-426-4435 if you suspect your pet has ingested a harmful substance. Yes, these can be a special problem. Foil and cellophane can be fun for pets to play with, but can pose serious tummy issues, even a blockage. Click here to read about other dangerous-for-pet items that might be around your home right now. Lorrie Shaw leads the pets section for AnnArbor.com. Catch her daily dog walking and pet sitting adventures or email her directly.